Last Spring at the Granny's Attic, some of us decided to do a Row-by-Row Round Robin quilt.Each of us would make one row, 40.5" wide, then pass along that row to the next quilter. She would add a row, and mail it forward, and so on. Here is my post showing my initial row. Last week at quilt camp was the "big reveal." Excitement grew when we saw how Lori hid the quilts behind blankets labeled "No Peeking." Eight quilt tops were hidden behind those blankets, and Lori had them pinned down tight so it was impossible to even lift a corner! 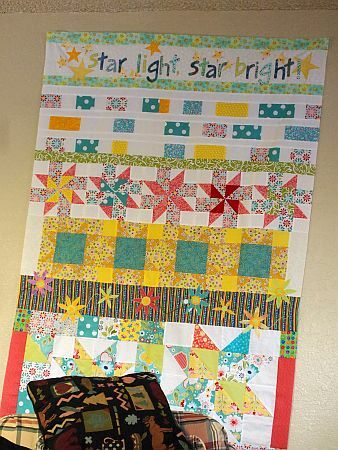 Remember my Tuesday Tutorial showing the blocks on Kathy's quilt? Here is "my" quilt. I call it "My Happy Place," because Payette Lake is indeed "my happy place." I love every single row my Idaho friends added, and I will treasure this quilt and the memories it evokes. I love my Idaho quilt camps! Next week I'll publish the road trip report -- three shops I've never visited before! I think this is a great idea - love yours - the colours are gorgeous. Good job everyone. I really notice how different each one is. Wonderful! Very beautiful quilts! I really like the blues in yours! I am glad you had fun at your camp! All of the quilts are great and each one is so different. I love the blues in yours! I love the cutting corners ruler and I reay appreciate your pictures showing how to use it. Thank you.